Biopesticides International was started from June 2005 and is devoted to studies based on plants, microbial, fungal, predator, parasitoid, and allied materials like bioherbicides and entomopathogenic nematodes including diverse studies of entomological, toxicological, agricultural, biochemical, molecular and biotechnological aspects related to biopesticides, including transgenics as pest control agents. 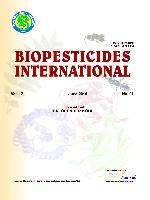 The journal also has a mandate to include the titles related to governance of biopesticides to cover issues that are in the realm of socio-political sciences, law and legal instruments, ethics, environmental impacts, etc. Indexed and Abstracted in:CABI abstracts | SCOPUS | Connect Journals. NAAS rating for this journal in 2017 is 4.82. The journal also has global impact factor of 0.598. Thompson Reuters impact factor is awaited. This journal will now be published as Print and Online by CONNECT JOURNALS.